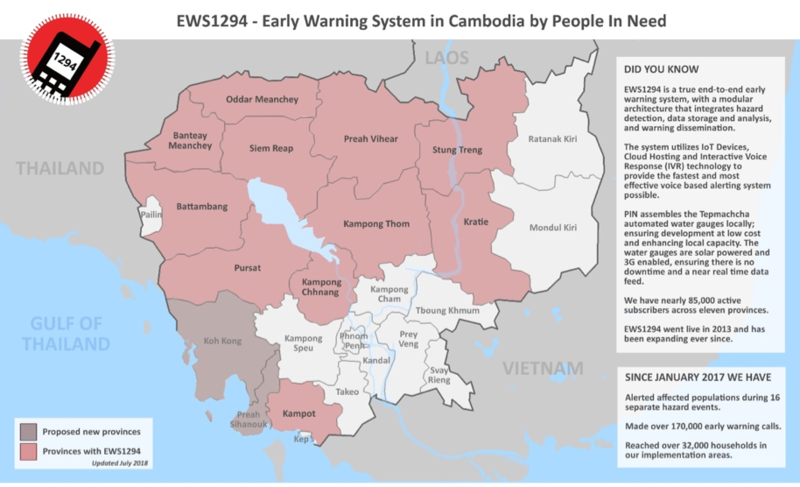 25 September 2018, Phnom Penh, Cambodia - In Cambodia’s Koh Kong and Sihanoukville Provinces, the UN Development Programme (UNDP) and NGO People in Need are preparing to extend an early warning system using SMS-based technology linked with data from recently installed automatic weather and hydrological stations, and the existing platform of EWS1294. The initiative will expand the coverage of EWS1294 to new areas, saving both lives and livelihoods. Under the collaboration, four additional water gauges will be installed in Koh Kong and Preah Sihanouk Provinces to monitor rain levels, and develop thresholds for issuing warnings. Ten at-risk communities will be trained to participate in Village Disaster Management Committees, as part of the disaster preparedness program establishing the disaster contingency plan. The collaboration aims to reach a total of 118,000 subscribers to the EWS1294 service, which currently has just above 88,000 unique subscribers. “We’re very pleased to announce this collaboration with People in Need over the coming months,” said UNDP Project Manager and Disaster Management Specialist, Muhibuddin Usamah. “With finance from the GEF-Least Developed Countries Fund, UNDP has been helping Cambodia to strengthen its climate information and early warning systems, including installing automatic weather and hydrological stations around the country. This complimentary partnership is a real step forward for these particularly exposed coastal provinces”. Developed by People in Need with the National Committee for Disaster Management, following severe flooding in 2011, the user-centered EWS1294 provides voice-based alerts and instructions to users, in the event of an impending disaster, such as a storm, flood, fire or outbreak of disease. The system is named after the government-supported mobile shortcode ‘1294’. The shortcode maintains free registration and provides cost-free outgoing calls. To register, users simply dial 1294 and follow some simple prompts. Since being piloted in 2013, EWS1294 has expanded and undergone annual improvements and upgrades. The system is a true end-to-end early warning system, integrating hazard-detection, data-storage and warning dissemination. Using solar-powered and mobile data-enabled water gauges, with cloud-hosting and interactive voice response, EWS1294 provides fast, relevant and context-specific early warning messages. The model is community-focused, with an eye to reaching the most vulnerable. In Cambodia, around 96% of the population reports owning a phone (in fact, over 99% of the population are reachable through some sort of phone). Based on this high-level of mobile penetration, and literacy levels of around 77%, audio messages are considered the most effective mode for delivering early warning to communities. The National Committee for Disaster Management of Cambodia has integrated EWS1294 into the disaster management strategy, and People in Need has a strong collaboration with the Provincial Committees for Disaster Management in rolling out the system. Plans are in process with the National Committee for Disaster Management to gradually hand over the system and associated responsibilities as well as synergizing with relevant initiatives funded by UNDP and implemented with the Ministry of Water Resources and Meteorology. With finance from the GEF-Least Developed Countries Fund, the UNDP-supported project ‘Strengthening Climate Information and Early Warning Systems in Cambodia’ aims to increase Cambodia’s institutional capacity to assimilate and forecast weather, hydrological and climate information. The country’s geographical exposure and the lack of adaptive capacity make it vulnerable to the impacts of climate change. With over 80% of the population depending on subsistence farming, rural populations are particularly exposed. In 2013, floods affected 1.7 million people, with an estimated loss of US$ 356 million. In 2016, floods affected 2.5 million people. The project has recently completed the installation of 24 automatic weather stations and 24 automatic hydrological stations nation-wide. People in Need (PIN) is a non-government, non-profit organization established in 1992 in the Czech Republic. In addition to humanitarian aid and human rights, PIN has a strong focus on disaster risk reduction, resilience programs, educations and supporting people living in social exclusion. Editing by Kate Jean Smith, UNDP Bangkok Regional Hub.